Be it for media trips, or for my academic research, the reality is that I travel quite a lot and I stay at a lot of hotels. The second night I stayed in Montreal after the Michelin media trip, I stayed at the Montreal Airport Marriott Hotel. 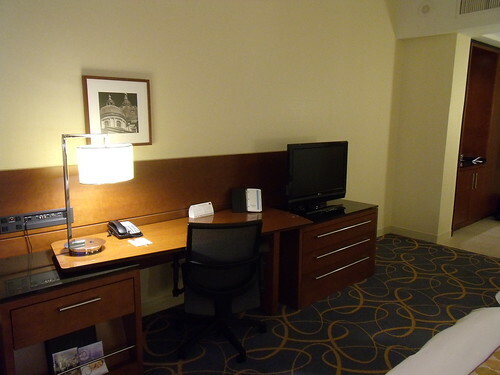 While a very nice hotel, and completely convenient because of the location, and with a really good staff, I was a bit disappointed in the Montreal Airport Marriott Hotel. 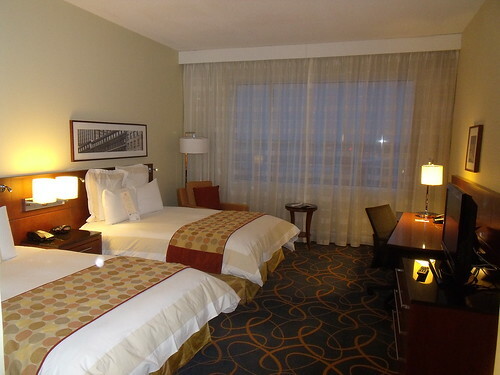 Our Montreal Airport hotel, located inside the P. E. Trudeau International Airport, boasts vibrant settings, luxurious guest rooms, stylish décor and legendary service. Perfect for both the business and leisure traveler, Montreal Airport Marriott Hotel is only 20 minutes from the excitement that downtown Montreal has to offer and close to top attractions including the Notre-Dame Basilica, Old Port of Montreal, Bell Center, Six Flags Amusement Park, Olympic Stadium and Botanical Gardens. Bijou, this Montreal Airport hotel’s trendy restaurant and bar, features fresh international cuisine in an innovative, upscale setting. 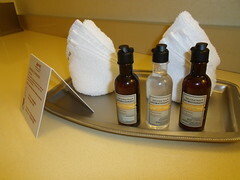 The hotel also boasts an indoor pool and fitness and business centers. Unlike other hotels near Montreal Airport, our hotel offers premier meeting facilities with over 14,000 sq ft of flexible event space, perfect for engaging corporate meetings, successful group events and exquisite weddings in Montreal. Experience the newest Montreal hotel near the airport for your next visit to Canada. Admittedly, it is located right at Montreal Dorval, or Pierre Elliot Trudeau, whichever name you assign to the main Montreal Airport. The source of my disappointment was not related to the service in and of itself, though. You may recall, I recently wrote about charges in hotels for internet access, and I frankly did not appreciate having to pay for internet access. While it is very nicely decorated, and it was really comfortable, with a pretty lovely desk, the internet issue (having to pay) really did not sit well with me. Also, the shower in the bathroom did not have a sliding door (which I found a bit odd) and given my inability to maneuver the espresso machine, I could not make myself coffee. Nevertheless, the room was impeccable and very comfortable. Disclosure: My stay at the Montreal Airport Marriott Hotel was covered by Michelin as part of the media trip I was on. As always, I retain full editorial control over anything I post on my site. The officious name we use these days is Montréal-Trudeau, because if you use the initials (P.E.T. ), it makes the French equivalent of “fart”.